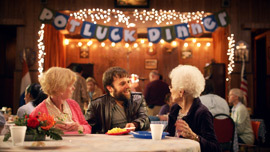 The campaign, from Wieden + Kennedy, takes a new twist on the “liquid gold” brand concept featured last year in a W+K campaign marketing Velveeta Shells & Cheese and Cheesy Skillets dinners to guys (“Eat like that guy you know”). The new campaign spotlights mac and cheese and other favorite recipes made with the classic Velveeta cheese “loaf,” as well as Velveeta Toppers cheese sauce pouches (launching this spring), by cautioning moms that some people in their lives may be “liquid gold diggers” looking to win their favor mainly to enjoy their Velveeta dishes. In one of three TV spots, “Friends” (15 seconds), one woman warns another that her significant other is a liquid gold digger, as he enters the kitchen requesting a batch of Velveeta cheese and broccoli soup (perfunctorily adding, “Oh, and you are so pretty”). In another, 30-second spot, “Jay,” a stranger, approaches an older woman at a pot luck dinner, flattering her about how young she looks in order to get a plate of her Velveeta mac and cheese. The last spot, also 30 seconds, features a teenage boy showing up at a friend’s house for a made-up sleepover (knowing full well that the friend’s at camp), just to get the friend’s mom to make him a hotdog with Velveeta Toppers on it. The campaign also includes in-store activations and flash banner ads that follow the stories of liquid gold diggers, driving viewers to Velveeta’s redesigned Web site for recipes. Social components include a quiz on the brand’s Facebook page to help fans identify and tag the liquid gold diggers in their own lives.